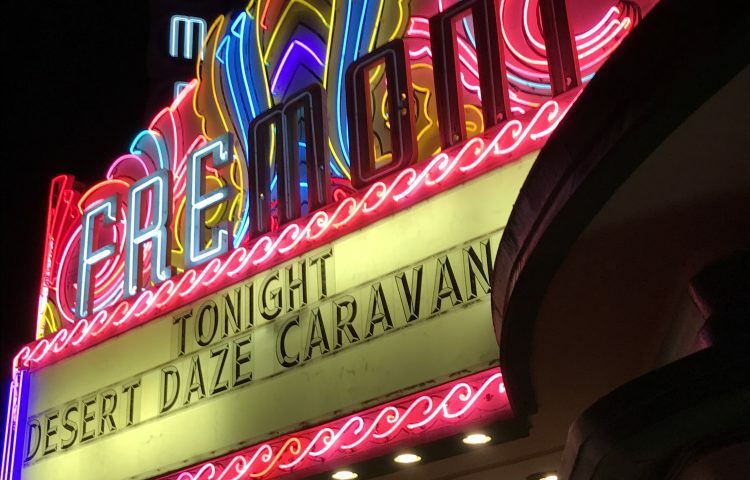 Fans of the weird and abstract flocked into the Fremont Theater last Friday to experience the second edition of the Desert Daze Caravan tour. The turnout, though, was less than I anticipated. All of the original openers (Nick Harim, JUUJUU, and SUUN) dropped from the lineup due to scheduling conflicts a few weeks before the tour started, but still I expected Ariel Pink and DIIV to attract a larger audience when I realized that the tour was making a stop in SLO. Walking into the theater, I could hear the shimmering shoegaze of DIIV echo through the walls. While I stood near the entrance to wait for some friends, cheers from the crowd caught my ears, forcing me to gravitate to the stage. At this point, I was immediately awestruck as DIIV started playing their single “Dopamine” while standing in front of an enormous psychedelic cartoon. Fremont’s crowd eagerly lining up in anticipation for DIIV. Once the initial euphoria of watching this Brooklyn-based four piece started to subside, I noticed that the crowd barely filled up the bottom of the theater. 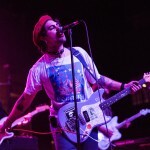 Around fifty people were able to witness the first half of DIIV’s hour long set which unexpectedly gave the show a DIY atmosphere. In between songs, Frontman Zachary Cole Smith made conversations with the crowd as the rest of the band tuned. They often forgot the order of their setlist, so Smith would stall and make jokes about the size of the crowd. This back-and-forth with the crowd allowed me to see DIIV as individual people rather than some big name in the indie rock community. DIIV didn’t disappoint. Their live set sounded as flawless as their studio recordings, but it was their humble stage presence that made them shine as bright as Ariel Pink. After closing their performance with the bass-driven song “Doused”, DIIV left the stage and greeted fans at their merch table. Not long after, more people poured into the theater as the stage was rearranged to fit Ariel Pink and his four band members. 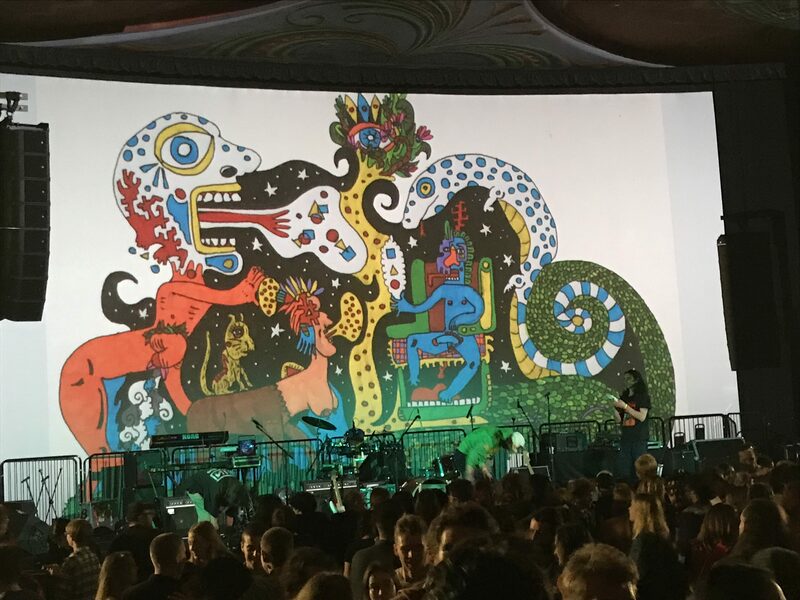 The projected psychedelic cartoon was replaced with a large graphic of Ariel Pink’s name while the stage crew continued to set up. 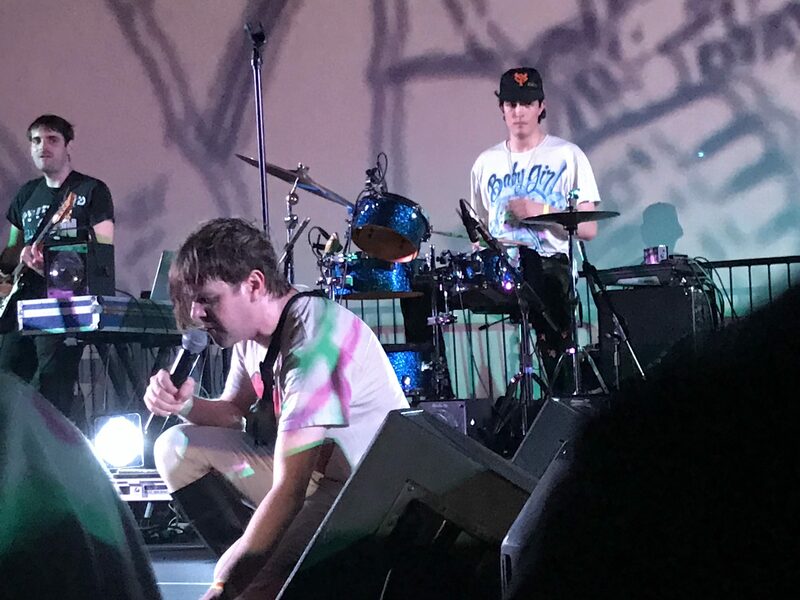 When Ariel Pink strolled onto the stage, the lights dimmed and the graphic switched to homemade videos that resembled the aesthetics of “Napoleon Dynamite’s” opening credits. Each video was a precious piece of eye candy created to visually compliment a specific song as well as feed the minds of those in the audience. Ariel Pink onstage in front of the San Luis Obispo crowd. Near the end of the night, Ariel Pink apologized for the theater’s audio quality because his voice effects were creating a lot of distortion. The crowd started to dissipate at this point until a small number of dedicated fans remained. Realizing that the audience was getting smaller, Ariel Pink joked that they only had ten more songs left to play. The last half hour of the set was an intimate experience because Ariel Pink began to engage in a back-and-forth with the crowd, similarly to DIIV. 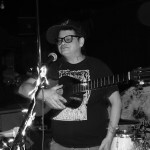 Listening to the crowd, he filled the rest of the set with songs from the solo project, Ariel Pink’s Haunted Graffiti. 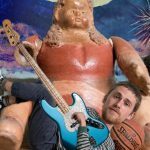 At the end of the night, despite the small crowd, the intimate experience with two of the most psychedelic bands around made this stop of the Desert Daze Caravan tour worthwhile. Spenser Judd is a KCPR DJ and content contributor, as well as a Cal Poly journalism junior. He wrote the article. Ian Ridsdale is KCPR’s Music Director and a Cal Poly political science junior. He took the photos.